Sandro Botticelli was one of the most well-known of the Medici employees. He studied under Fra Filippo Lippi and had a technique which focused on line, and his forms were lightly shaded. While art historians consider Botticelli to have been an expert at using line, he was also adept at using color. The Primavera, the title of which means “Spring”, is among the greatest works at the Uffizi Museum in Florence. The precise meaning of the painting is unknown, but it was probably created for the marriage of Lorenzo di Pierfrancesco (a cousin of the powerful Lorenzo the Magnificent Medici) in May, 1482. The scene shows us a group of figures in an orange grove. One of the first things we should note is that little is used in terms of perspective; while some atmospheric perspective is visible through the trees to the right and to the left, we do not see the one-point linear perspective here which some of the early Renaissance masters had used so effectively in the fifteenth century. Also, note how most of the figures have limbs which are long and slender and appear rather elegant. 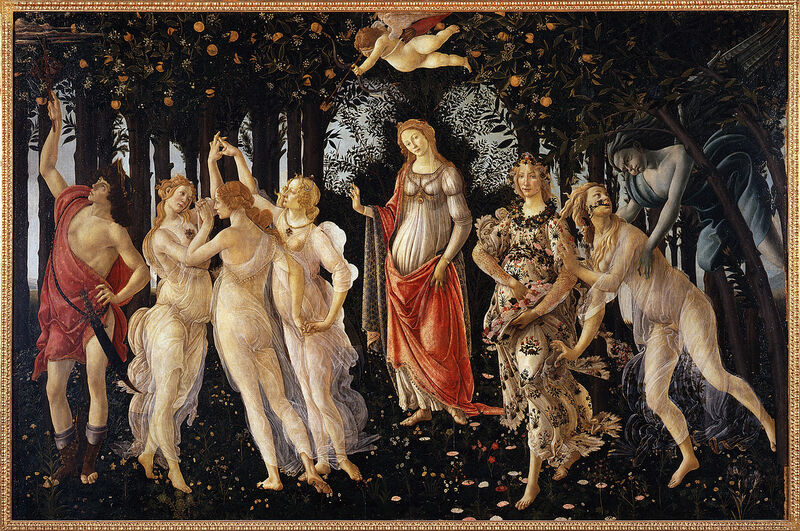 Botticelli produced art at a time when there was a demand in the court of Florence for this type of work. To the far left, Mercury, the god of the month of May, has a staff which he may be using to usher away the winter clouds. He is readily identifiable by his prominent winged sandals. To the right of Mercury is an important group called the Three Graces. 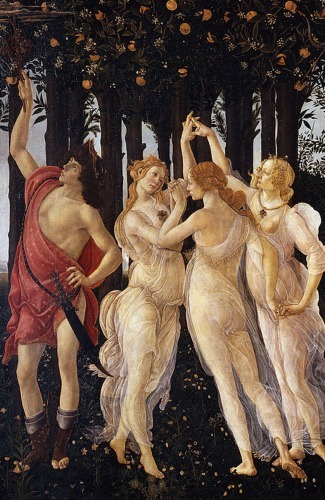 These women, who appear to be involved in some type of dance, were modeled by Botticelli after an ancient depiction of the Three Graces. These figures are important because they represent the feminine virtues of Chastity, Beauty, Love, all of which point to romance and provide us with some context in terms of what is going on in the painting. The Roman writer Seneca refers to them as “pure and undefiled and holy in the eyes of all”, and we can see the pearls on their heads which symbolize this type of purity. 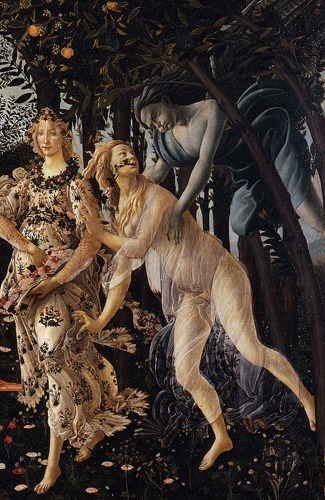 Their clothing is like lace, very light, and see-through, which demonstrates Botticelli’s virtuosity in depicting such kinds of fabric. It is interesting to see that they are being targeted by Cupid’s arrow, which reinforce the idea of marriage. On the right side, we see another group of figures which includes that of Zephyrus, the west wind, about to take a nymph named Chloris. After he succeeds in taking her for his own, they are married and Chloris transforms into Flora, the Spring goddess. Here, Flora is depicted throwing flowers that have been gathered in her dress. This is a means of symbolizing both springtime and fertility. Taking the scene as a whole, it is probably best understood in light of an allegorical meaning. The allusions to Spring and the month of May, the scene of a suitor’s pursuit, the Three Graces – all of these point to the idea of a springtime marriage. The setting in an orange grove is also noteworthy, since the Medici had adopted the orange tree as its family symbol. The painting would have been placed in Lorenzo di Pierfrancesco’s bedroom and his wife would have seen it for the first time after their wedding, so the idea of Cupid targeting the pure Three Graces with his arrow takes on a particular meaning in light of conjugal love. In any case, the painting is a testament to humanist interests in classical subject matter in the Renaissance, as well as the courtly desire for lavish themes and graceful figures. 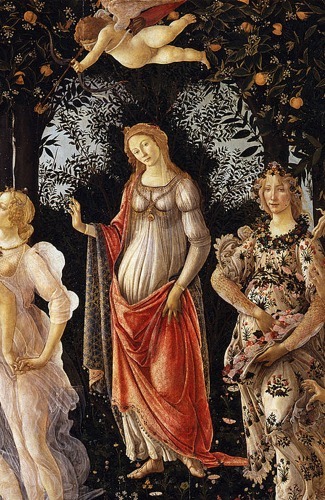 ItalianRenaissance.org, "Botticelli’s Primavera," in ItalianRenaissance.org, June 26, 2012, http://www.italianrenaissance.org/a-closer-look-botticellis-primavera/.